Provides the extra safety of always being attached to a safe point. Extra safety when moving from point to point. Clip one of the lanyards to your new position before unclipping from the old. Similar to the standard lanyard except it has two legs with stitched shock absorbers and single hook to attach to your back. Steel hooks, 5' legs. Kit includes 5/8” x 60’ horizontal line, synthetic energy absorber, line tensioner/adjuster, 2 steel cable anchorage slings, 2 auto locking caribiners, 2 lanyard attachment ring Fireman’s Hooks and storage bag. Strong and handy loops are rated at 5000 lbs. They come in 12" 24" 36" and 48" lengths. One of its most common uses for the 11" loop is for hanging your split side pulley to a pipe. Choke the loop over the pipe and attach your caribiner. Then attach your pulley to the caribiner. Another method of attaching the caribiner to a stage pipe is by using the fireman's hook. This pulley is for 5/8" line. The wheel is solid aluminum. The BLACK sides are aluminum. Rated at 5,000 lbs. Independant rotating sides like the RP-101 for easy rope access. This pulley is for 5/8" line so it fits all the hand lines in this catalog. The wheel and sides are aluminum. Rated at 5,000 lbs. This pulley is for 5/8" line. The wheel is made of hi-tech Celcon (a nylon-plastic), the RED sides are aluminum. Rated at 3,500 lbs. The really great thing about this pulley is that the sides rotate independantly. That means you can put the rope into the pulley any place along the length of the rope not just insert it from the end like in standard fixed pulleys. Finally "who's got the pickle?" may never be heard again. Only slightly larger than a twistlock plug, the Pocket Pickle can be carried on your belt with the included carabiner. Anyone who has the responsibility of operating chain motors should have their own Pocket Pickle. 4 pin 20 amp (Hubbel 2411). Please be sure that your motors are compatible with this 4 pin configuration. 3 pin version has been discontinued. Safety pulley combines an integrated cam which allows the rope to move through the pulley in only one direction without slipping backwards. Supports a working load of 4kN (over 800 pounds). Aluminum split side design is like the RP101 and RP102. You can insert the rope at any point rather than threading it in from the end--a great time saver. Sealed ball-bearing and a 1.5" diameter sheave for smooth and efficient hauling. 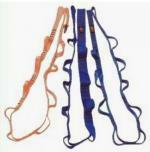 Fits rope sizes 8 - 13 millimeters. Three slots to crimp three different size steel cables: 1/8", 3/16", and 1/4"
One slot for crimping 1/4" Steel Cable. 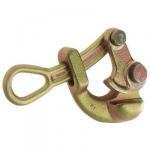 The Large Klein Tool is the industry standard and used by riggers to haul steel cable. Made by Klein, its actual name is a "Haven Grip." The large size is used for cable from 1/8" to 1/2" diameter. It also has a locking device to keep the cable from slipping out. The small Klein Tool is used for cable from 1/16" to 1/4" diameter. This is a non-locking cable puller. Order here to choose any number of 100 foot lengths of 5/8 black handline. If you want a color other than black, tell us in the "ordering options" box on "view cart" page. Although we may not be able match the color you want, we will contact you with close options. 100 feet weighs just 7 pounds. Extra wide gate fits over stage pipes. Here's a large, forged steel screw-lock caribiner with a very special side opening gate. The gate actually opens on a slight angle away from the oposing side to provide an extra large opening. This 7" long hook will fit over standard stage pipes and has a gate opening of 2 3/4." Comes with an optional rope guard pin. Felco invented the "triangular cut". Research shows that this system of forming the blades into a triangle while cutting allows wire rope to be cut without being crushed. Hardened steel blades and center bolt, unbreakable forged aluminum alloy handles with plastic covering for good grip. Cuts wire rope up to 3/8 inch or 9 mm thick, high tensile steel strands up to 7 mm thick, stainless steel strands up to 6 mm, extra tough wire rope or stands up to 5 mm. Cuts electric cables of copper, aluminum or steel-cored aluminum up to 9 mm. Cuts aluminum or copper rods up to 9 mm diameter, steel rods up to 7 mm and tempered steel spring wire up to 4 mm. Length 13 inches. Weight 26.5 ounces. The best steel cable cutter ever. One-handed operation. This is another industry standard tool. There's no sense in buying a cable cutter that's not going to last or cut steel cable cleanly. The Felco is the best you can get. Unique triangular jaws never leave a frayed cut. Hardened steel blades and center bolt. Cuts wire rope up to 1/4 inch or 7 mm thick, high tensile steel strands up to 5 mm thick, stainless steel strands up to 4 mm, extra tough wire rope or stands up to 3 mm. Cuts electric cables of copper, aluminum or steel-cored aluminum up to 7 mm. Cuts aluminum or copper rods up to 5 mm diameter, steel rods up to 4 mm and tempered steel spring wire up to 2 mm. Length 7 1/4 inches. Weight 9.5 ounces. The Felco C16 two-hand cutter is recommended for cutting steel cable up to 5/8 inch in diameter or 16 mm thick, high tensile steel strands up to 14 mm thick, stainless steel strands up to 7 mm, extra tough wire rope or stands up to 6 mm. Cuts electric cables of copper, aluminum or steel-cored aluminum up to 16 mm. Cuts aluminum or copper rods up to 14 mm diameter, steel rods up to 10 mm and tempered steel spring wire up to 5 mm. Enjoy the optimum cutting yield thanks to the shape of the handles and special steel blades. The C16 is a cutting tool capable of satisfying the most varied industrial requirements. Hardened steel blades and center bolt, unbreakable forged aluminum alloy handles with plastic covering for good grip. Weight 5 pounds. Length 23 inches. The Felco C12 two-hand cutter is recommended for cutting steel cable up to 1/2 inch in diameter or 12 mm thick, high tensile steel strands up to 8 mm thick, stainless steel strands up to 6 mm, extra tough wire rope or stands up to 5 mm. Cuts electric cables of copper, aluminum or steel-cored aluminum up to 12 mm. Cuts aluminum or copper rods up to 10 mm diameter, steel rods up to 8 mm and tempered steel spring wire up to 4 mm. Enjoy the optimum cutting yield thanks to the shape of the handles and special steel blades. The C12 is a cutting tool capable of satisfying the most varied industrial requirements. Hardened steel blades and center bolt, unbreakable forged aluminum alloy handles with plastic covering for good grip. Weight 3 pounds. Length 19 inches. Forged aluminum, the D shape provides more strength than the traditional oval carabiner. Non-locking and rated at 23 KN (5000 pounds), black.